Feelings are delivered perfectly when you send this Distinctive Floral Assortment of 30 Pink Roses and spread your love in the lives of the people dearest to you. 30 Pink Roses Bunch with Cadburys Celebration pack. 30 Pink Roses Bunch with Three Colourful Balloons, Teddy Bear. 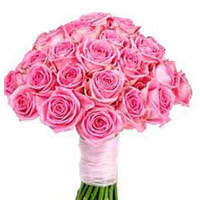 30 Pink Roses Bunch with 500grms Assorted Sweets. 30 Pink Roses Bunch with 16 pcs Ferrero Rocher chocolate box.